M48 OPS Tactical Asault Backpack - Black | BUDK.com - Knives & Swords At The Lowest Prices! 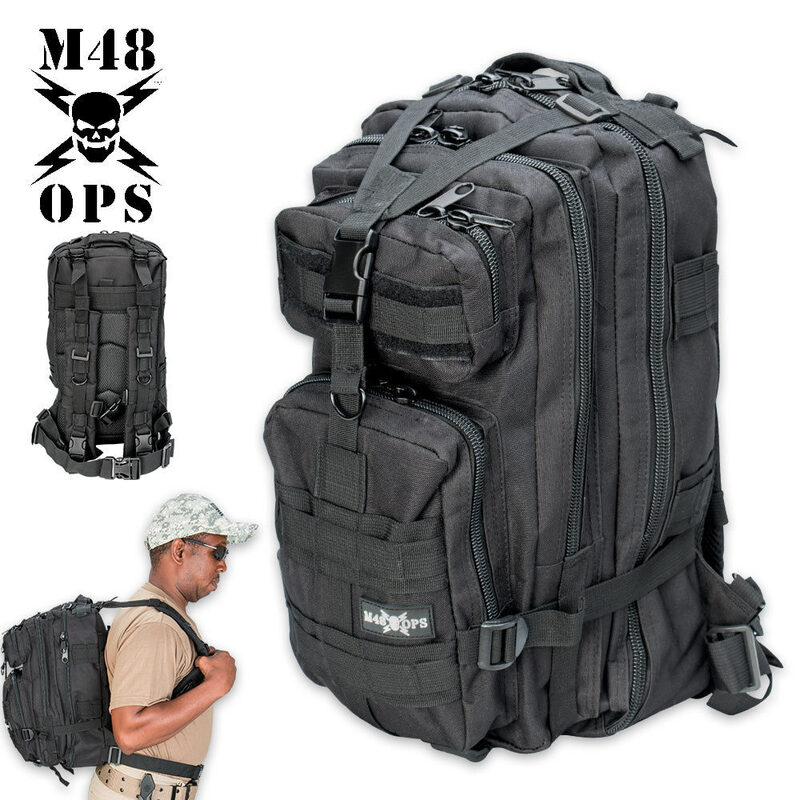 The M48 OPS Tactical Assault Backpack is perfect for use as a bug-out bag. Constructed of 600D oxford material, this backpack is extremely durable. The main compartment has a big mesh pocket to keep items secure, as well as, a zippered pocket. The back of the pack features cushioning mesh straps - both adjustable and removable. 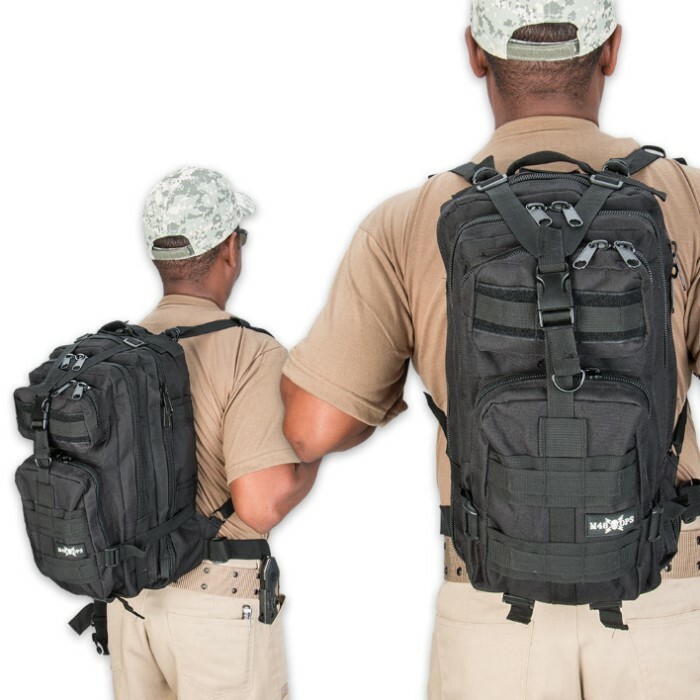 The front of the bag features MOLLE straps, as well as two zippered compartments. This backpack is perfect for a variety of uses! I have this bag although mine is a Desert Tan, The bag is great, as long as you dont load it down with much weight. Anything over about 15 pounds and the shoulder straps slide off. wouldn't recommend it for a bug out bag. but would definitely suggest it for a work/light travel bag. I use mine as a work bag (since im a computer tech this works great.) its able to hold several writing utensils. a notepad, a screwdriver/bit driver toolkit, a good sized toolkit in the main pocket (i have a breifcase style tool kit that fits perfectly in the largest pocket, and my work surface tablet fits perfectly in the middle tab with the charger cable and mouse, the bag protects rather well, considering it protected my surface tablet from damage when i was in a car wreck, no injuries, just got side swiped which cause my truck to roll off the road and down a small hill, no damage to tablet, toolkit, or bag.) The chest straps are almost too small to fit an average persons chest. (if youve got a 34" chest diameter, you're just barely gonna get the straps to click together.) Great bag. in the end. would definitely recommend it to anyone who just wants a small, Overnight bag, a light toolbag, or a decent work bag. There is no paracord. It is tiny compared to the picture. The chest and belly straps could fit a child but not an adult. Couldn't fit a medium sized folder in the main compartment. The zippers are LOUD when you walk or move. On the bright side it seems rugged. It fits perfectly on the back rest of my Harley. It holds my essential gear (i am a real minimalist so it isn't much) and it performs the roll i bought it for. Having a bag i can take with me on the bike and detach from the bike when i arrive. I love the concept of the bag, but I hoped for more used if it. Unfortunately, the left shoulder strap broke way too early in the purchase and use of this backpack. I agree the straps are too thin and not secured well to the pack itself. I agree, the picture shows a grown man wearing a larger sized backpack. It's way smaller than in the picture, which is why I assume there are no dimensions or measurements. But all in all it will be put into good use. Quality seems to be strong to hold the necessary gear. When I saw M48 had a backpack I jumped on it. Upon taking it out the box I immediately noticed one thing. It's a lot smaller then I expected. Unless you know what 28L capacity means be careful. I was expecting a full size backpack with all the bells and whistles. This back is very narrow only about 8in. wide and about 17in. tall. It expands forward to about 10-11in. across the 3 compartments. So unless your a minimalist don't expect to pack a ton of bug out gear in this thing. I put a moderately padded adult size pair of lacrosse gloves in the main compartment an couldn't add much else. It also doesn't have standard shoulder straps. They are detachable inch thick nylon straps with a thick padded cushion in the middle of the strap. In the middle of the strap. So the area in front of your shoulder would be cushioned but if the weight of the bag was to pull it down I wonder how comfortable it would be across the top. I assume there is a 'tactical' reason for this construction besides easily getting out of the pack in an emergency but either way now you know what to expect. The strap closing across the chest is to short to fit across any adult size frame let alone my large upper lady parts. And the strap across the waist would probably fit a child. But it's removable so it can be ditched or used for something else. There are some straps at the bottom that could possibly hold a small bed roll but it's not very big and doesn't leave much room for adjustment. Other than those things, the material is thick and rugged. It looks like a cute little version of awesome. There are several places to hook things to because they surely won't all fit inside the bag. The side straps snuggly hold my Escrima sticks without slipping out. The zippers are big and sturdy but do not contain any paracord. 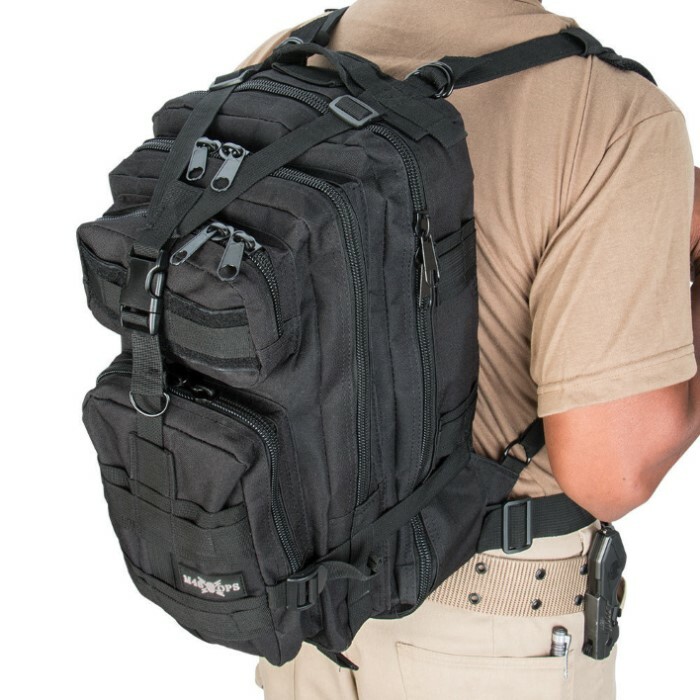 Decent bag for EDC if your not packing a lot of stuff.